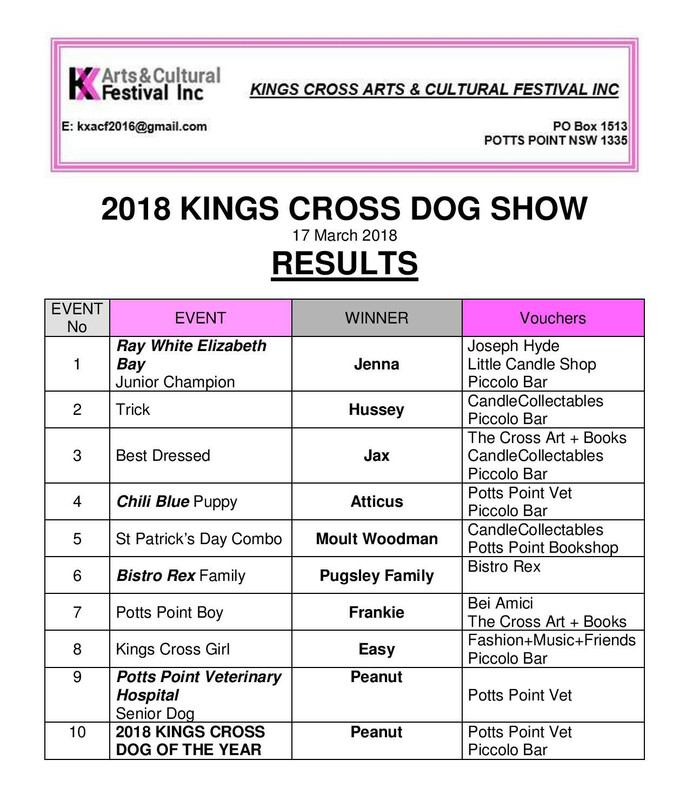 2018 Kings Cross Dog Show – Kings Cross Arts & Cultural Festival Inc. The 2018 Kings Cross Dog Show was a great success. Ru Bella provided a wonderful performance as always and as a bonus sang with Dorreen Manganini. About 300 people attended and there were lots of smiles in evidence. Below are the full results of the competitions held on the day — along with twelve videos which show all the entrants and winners in each event. Congratulations to all the dogs and their owners! Thanks to everyone who helped with this great event: our generous sponsors; our MC Ru Bella; our judges Cindy Pastel, Ian Roberts, Dorreen Manganini and Ayesha; our visiting dignitaries Mandy Sayer, Kerryn Phelps and Tanya Pilbersek; and the hard-working volunteers of the 2011 Residents Association and of the Kings Cross Community Centre.